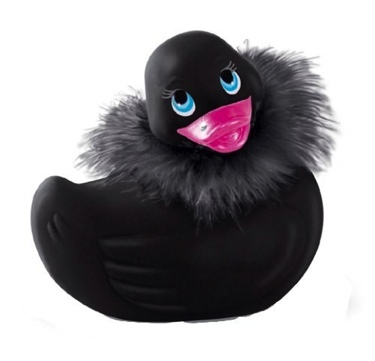 I Rub My Duckie Paris Noir Travel Size Massager Parisian women are renowned all over the world for their elegant style. Our globe-trotting I Rub My Duckie found this to be true during a recent romantic journey to the City of Lights, where he discovered a lover of great mystery and charm, a Femme Fatale by the name of Paris, the embodiment of Parisian style and seDucktion! You, too, are sure to be enchanted with Paris, elegantly dressed in feathered boa and genuine Swarovski crystal beak jewel! Like all I Rub My Duckie products, Paris is waterproof, the Boa is removable, and very discreet, featuring strong, but quiet vibrations. With Paris Duckie, life and bath time are truly magnifique! Specifications 1 speed. Available Colors: Noir, Rose, Violette. Each sold separately. I Rub My Duckie dimensions 5 inches by 3.5 inches 5 inches. Battery Requirements: 2 AA Alkaline Batteries, not included. Contains no: Latex, Natural Rubbers, Phthalates or Toxic Heavy Metals like Cadmium and Lead. International Safety & Environmental Compliance: CE, ROHS, WEEE and ASTM. Big Tease Toys toys that play with you.